← Dancer Tribute 2/25/12: Carrie Ann Inaba (Honolulu, HI). What is your favorite dance scene or judging comment by Carrie Ann Inaba? 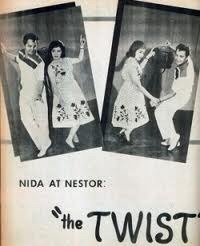 Dance Step Tribute 3/2/12: The Twist (circa 1960), What is your favorite dance memory of The Twist? Where were you in 1960? I know, I know, most of you were not born yet. I’m not claiming to be as old as Methuselah, but hey I was there back in the early 1960s. 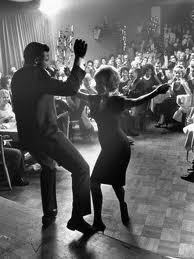 I watched my Mom & Dad dance back then, because back then they were young and cool. So the kids tried to be like them and imitate stuff they did. Some imitated stuff was good, some not so good. I envied the grown ups drinking coffee during the day and my Dad drinking beer with my uncles later that night in our garage. I used to steal sneaks of coffee as well as beer. Maybe that explains why I still drink coffee and beer today, LOL. Our garage had the first MAN CAVE I ever seen. We lived on 34th & Flora and the garage had the popcorn ceiling with the gold glitter. Popcorn ceilings are tacky now, but back then I loved the glitter and of course later on being a Belly Dancer, anything with Bling, Shimmer & Shine! I still have dreams about being in that garage and watching my Dad drink Miller Beer with Uncle Nathaniel, Jackie, and the rest of the gang. My family danced! Mom & dad, my aunts and uncles. So when they did the newest dances like the Twist, the Funky Chicken the Jerk, whatever, the kids imitated them. 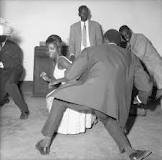 My Aunts Forestine and Ernestine were younger than Mom & Dad, so they brought the newest steps to the family and after the kids learned the “new” dances, we tried to get attention by performing them. So the first dance that I remember performing for attention was the TWIST. Boy, if only the “cool” uncle that had the only video camera could have filmed us back then. You know that all 8 mm and that to be developed and used for only very special occasions, not something as common as the kids trying to dance. 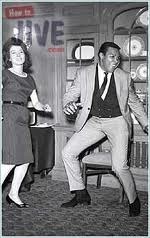 It was so cool when Mom & Dad would call upon you to dance. Not my brothers & sisters, but me – ha, ha. Sometimes they called another kids to dance and brag about said kid and ask the whole family to watch, so when you got your turn to dance the newest dance, you better do your best or next time, they might not ask you. Hmmm, no wonder I wanted to go to dance school and then later on became a belly dancer. I loved watching Len Goodman dance the Twist on Dancing with the Stars. It was a treat to see Chubby Checker performing after 50 years. Damn, has it been that long? Rock on Len Goodman! Rock on Chubby Checkers! Rock on The TWIST!!! Now is your time to Join the Conversation! Comments, questions, concerns, controversy, rebuttals, tributes, blogs, guest bloggers, etc., are all welcome! What is your favorite dance memory of The Twist? I have been searching about for an write-up like this. Took some time but finally identified itâ€¦ Really great read thanks. Itâ€™s been difficult to locate the data I necessary. I use this internet site for a good deal. Thank you for another informative site. Where else may just I get that kind of info written in such an ideal method? I have a undertaking that I am just now running on, and I’ve been at the glance out for such info. Wonderful beat ! I wish to apprentice whilst you amend your web site, how could i subscribe for a weblog web site? The account aided me a applicable deal. I were a little bit familiar of this your broadcast provided shiny transparent concept. Hey there. I want to to inquire somethingâ€¦is this a wordpress weblog as we are thinking about shifting more than to WP. Also did you make this theme on your own? Thanks. Real instructive and great anatomical structure of articles , now thatâ€™s user pleasant (:. I love the appear of your site. I recently built mine and I was seeking for some design tips and you gave me a few. May possibly I ask you whether you developed the internet site by youself? Hello there, just became alert to your blog by way of Google, and identified that it is actually informative. Iâ€™m going to watch out for brussels. I will probably be grateful should you continue this in future. Lots of individuals will likely be benefited from your writing. Cheers! I came to the exact conclusion as properly some time ago. Excellent write-up and I will probably be sure to appear back later for more news. It’s perfect time to make a few plans for the long run and it is time to be happy. I’ve learn this post and if I may just I want to counsel you few interesting things or suggestions. Perhaps you could write subsequent articles relating to this article. I wish to read more issues approximately it! I got what you intend, thankyou for posting .Woh I am thankful to find this website through google. “No one can earn a million dollars honestly.” by William Jennings Bryan. hey there and thank you for your information ¡V I¡¦ve certainly picked up something new from right here. I did however expertise a few technical issues using this site, since I experienced to reload the site lots of times previous to I could get it to load properly. I had been wondering if your web host is OK? Not that I’m complaining, but sluggish loading instances times will sometimes affect your placement in google and can damage your high quality score if ads and marketing with Adwords. Well I am adding this RSS to my email and can look out for much more of your respective intriguing content. Ensure that you update this again very soon..
We are a bunch of volunteers and beginning a manufacturer new scheme in our local community. Your web site offered us with beneficial information to paintings on. You have carried out a formidable task and our complete community may well be thankful to you. Well stated. I appreciated that extremely considerably.